I recently received the comment below (truncated for this post) that intrigued me regarding the selection of all star teams in youth league baseball. (Follow this link to the full comment). This comment piqued my interest because I have not been exposed to the politics of the all-star team selection process in youth baseball since I was a kid. My son plays AABC baseball in Southern Ohio and they do not have an all-star game or all star-post season. I guess since he plays at the highest level of select each team is considered an all-star team. But I do remember playing in an All-Star game when I was a kid. I was one of the better players in the league, but my dad was the coach and on the selection committee. Did I make the team because of my dad or because of my ability? The coach who posted the comment below shared how the Dixie Youth Ozone League picks their all-stars. The league put rules in place to mitigate the politics or so they thought. I think that the process they they follow seems fair but not full proof. How does your league determine the all-star team? My son is on my team, so lets keep in mind last year at a rules meeting I submitted a proposal to change the all star selection to a statistical based selection, so that there would be no politics at all. This proposal was shot down by over 60 votes. So fast forward to a few days ago. through the 2nd round, I had only one kid from my championship team in that top 9, so when I went to ask about my son, i find out that the other coaches did not give him a single vote. He hit .635 14 home runs, and had an on base percentage of over .700. For the other coaches not to give him at least one vote was beyond me. So my next three picks i chose kids off of my team, who deserved to be all stars, and should have been in the top 9 already based on their stats on the year. When I left out of the room, I was about to resign my post as All star coach over the politics that took place to exclude my son from the team. Read the rest of the comment and how this coach and his son handled the situation on my post called Youth Baseball: Cutting Players about the ugly politics of youth sports. There are two sides to every story and I cannot know if the coach's son was worthy of an all-star selection or not, but I do know that politics, personal bias and collusion exist in youth sports. The only way to avoid the situation above would be to have an unbiased professional scorekeeper at each game and lets the numbers decide. And that even has flaws because how do you value a pitcher vs a hitter. Or a speed kid vs a power kid. Or a kid who can hit but can't field well. So scratch that idea, I have concluded that there is no good way to choose an all-star team in youth sports. How does your league (Baseball, or other sports) choose an all star team? Share your stories. Without an impartial scorekeeper who really understands hits versus errors, fielder's choice, etc. - no stats based selection is possible. Best bet is a combination of selection from the coaches in the age group, and then a tryout that's panel judged with some coaches in the age group and not in the age group. hi Dennis - I'm not sure about the tryout - I think that the All Star team should be based on the performance during the year. Reward those who did well. What if there performance is great and they still not make it. 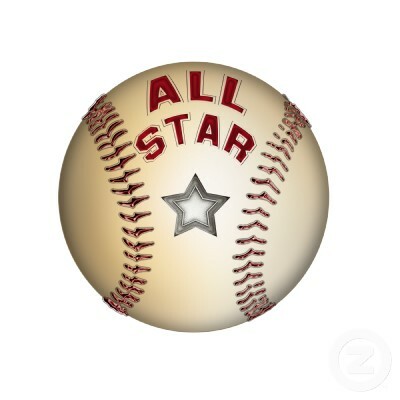 In our league, each team is represented because they each pick their own players to play in the All Star game. This year we have 8 teams so we will allow three players from each team. As a coach, I have let the boys vote by secret ballot for the last 4 years. With the provision that the coaches could overrule the voting if someone that didn't deserve it got selected because of kids politics. So far this has NOT happened. Each time the kids picked the best players on the team. The hardest part for me has been to tell one of my own boys that he didn't make the All Star team but his twin brother did. It hurt him alot. That year we had more teams so we could only send two kids per team. Not a baseball coach, but I was thinking about doing peer based secret ball selection, and now have more confidence to do so after reading this post! The criteria: 1 offensive player, 1 defensive player, leader (ie. who's helped individuals become better), most improved, works hardest in practice. Tom - That seems fair and keeps you out of the politics. The boys on my son's team picked captains like that. We have All Star tryouts early in the season. They travel on the weekends throughout the regular season. So it overlaps. Last year my son was on the 8U team. It was thrown together half way through the season to play in three tourneys. Each coach was asked to send their two best players. Some coaches only sent one and some didn't send any, not believing they were All Star caliber. When that happened we were able to send a third kid to complete the team. It worked out fine. But I see where it could have been a mess. This year there were tryouts. Instead of the coaches for the teams picking, there was a panel of judges from other age groups evaluating the kids. The coach of the team had some say as well. This has turned out ok too. You're right, there is no full proof way. Especially when you don't have the current season of stats to look at. I played baseball for about 15 years from Pee Wee League thru Freshman year of College. I was always a pretty good player. I know all about the politics of youth sports and I was a victim of politics several times. I have coached for about 10 seasons in T-Ball, Rookie, Minor, Babe Ruth and Softball. I just took over as President of our Local Baseball League and our league had no bylaws, rules, or anything in writing. I am in process of writing bylaws and rules for our league (pending board approval) and the hardest thing to come up with is a fair way to select All-Star teams. All ways can be written to be fair but the Managers or Personnel involved with the selection has to be knowledgeable, unbias, fair, and logical. I also coach and have a son that plays and he is always one of the best players in his division. I can lay out the ground work and with the help of our League Board enforce our rules but cannot ever gaurantee the best decision. There seems to be no ONE RIGHT WAY to ensure a deserving kid does not get left out but I will sure do my part to uphold what is right. THanks so much for sharing your perspective - You cannot please everybody in this world of entitlements. Good luck. How about selecting all-star managers? Our league typically offers the manager with the best regular season record the chance to manage the all-star team. This leads to preseason scouting, tanking tryouts and other politicking. I've seen great managers get passed up because their goal is to teach baseball to youngsters instead of sending scouts to the fall ball program. My son is going through this now. He probably had the highest batting percentage in the leauge (probably around 650-700), had three strike outs for the whole year, and was a high mediocre fielder. One of the kids in the league had around .200 batting average and probably missed 2/3 the balls hit to him. Guess who's dad is best friends with the head of the division and is vp of a local business. Guess who's on the team and who isn't. I guess it will have to serve as a life lesson for your kid - the kid who is handed everything without earning it will one day be on the bottom looking up at you kid - be it in sports, school, relationships. career. I cab relate to this comment as well. My sons batting avg is .849 this year. He has struck out only 5 times. This includes all tournaments played and the season games. He is a very good fielder and a guaranteed hit. His hits are not power hits, like over the fence, but he gets rbi's and base hits every time. My son is also disabled. He has a condition called ERBS Palsy. He is partially paralyzed in his left arm, hand and shoulder. But it does not stop him. He works harder than most other kids on the team and even takes extra practice at home. We have had the same team together for 4 years now, but we are not "select". But for some reason, our coach will not give my son the chance to play any other position or give him the opportunity to be play all stars. He never picks any other kid from our own rec, but goes outside of our rec to pick up to just play all stars. I really dont think this is fair to my son, that had the 3rd highest batting average, or for any other kid from our rec that deserved to play. Im not sure but someone told me that a kid cannot play all stars if they didnt play in the same rec the previous year. Is this true?:?:? Can anyone advise me on this?? Baseball Mom, SC... I am constantly told different regulations as the regular seasons goes on, from the picks for All Stars is equally devided among field teams, to the Champion team gaining 1 pick extra... Now we have 3 teams and somehow... Our team (last place but have 4 players equal to the best players on the other 2 teams) were only allowed 2 picks. ALSO, each team gets to send 1 alternate to sit the bench and participate at practices to complete a team os 15... NOW, if the picks were even, each team would have sent 4 from their team plus 1 alternate... Now my son, our best 1st base player is a second string alternate because it was decided both best teams got 5 picks leaving us with only 2.... CAN SOMEONE PLEASE explain to me how this is equality in out ball park much less, giving all the best boys on all teams a fair chance to play All Stars???? Keep in mind, we have great players and then some of the worst with no one really in between on our team. It was a young team as well. Why should our seasoned and best players have their chances cut in half because of poor politics??? I am very upset at our field not having decided on their rules and by laws prior to All Star selections. They made up their by laws as they went along :/ Is that even legal in Dixie Youth??? Same with my kid. Just finished up his last year of little league with no chance throughout the years to make the summer team. It is the all-buddies team. They pick only 11 kids every year. The tryouts are a joke. The same core 10 have been on it since t-ball. The really frustrating thing is that two of the kids on the team are playing up! But they are good friends with the other kids. Why can't they just play at their own age level? My guy struck out 3 times this year (early in the year). His batting average and OBP was very high...but like others here, he was not a HR hitter (like most of the all star team). Just got base hits and the occasional double. Very good fielder, very fast and athletic, but smallish for his age. His coach had him at SS most of the year but he can play any position well- even played catcher well. He was also the team's 4th/5th pitcher and often closed tight games.He had a streak of 4 games straight where he had a perfect OBP. He was hitting the very best pitchers in the league with ease all year. He put in a lot of hard work this year and it just kills me that he never got to experience the high level summer play. He loves the game so much and plays it well. Venting here, but I wish there were summer options for him. It is frustrating that so many towns around us he would be playing on, but we are stuck in this league. We have a situation in our town that I believe is in direct conflict with the intent of Dixie Youth Baseball. Historically we have had a National and an American league with each fielding a tournament team. This year, a group of coaches who, coincidently, coach a 12U travel team encouraged the local league to reduce the number of teams so their would be only one division and therefore only one tournament team. As a result, there were 15 and 16 playets on each team which decreased the amount of playing time of the weaker players. The purpose was to make sure tbey had a strong tournament team rather than two weaker teams. The selected tournament team is exactly the same as the 12U travel team including the same coaches. If they wanted to stack a tournament team they could have done it in a way that would have at least given the weaker players a chance at more playing time. I do not believe what these select coaches and the league did would measure up to the ideals of Dixie Youth Baseball. Does Dixie Youth Baseball have competitive levels? In Cincinnati (in the younger age groups) there are 6 levels of baseball. Three levels in Little League and three levels in Select. This provides a wide range of options for a parent to put his or her kid at the right level. I think that the Manager that wins the league should be able to pick his own team. He is the one that is going to be putting in the sweat and tears. If he wants to do well he will pick the best players. It should never be about the manager. But to often it's the mangers ego that gets in the way. My 11 year old son is 'the new kid' in the league. We just moved here last fall. He is playing on an 11-12 year old regular team and is a great player. He pitches and up until this year, has always played first base, since he was 6. The first day of practice, before the kids even started practice, the coach asked me what positions he had played, previously. I told him. He then told me that he wouldn't be playing first base, because HIS son plays first base. He hadn't even watched my son play yet, but made that decision. My son now plays shortstop and pitches. They've only had 4 games so far, but in those games, he's played his shortstop position flawlessly and in 11 innings of pitching, has 16 strikeouts and the rest were fly balls or grounders which resulted in outs. He had one batter reach first base, because of a fielding error by the catcher, but my kid picked that runner off at first. I've been to every practice and every game. The coach's kid is lazy, acts like he could care less whether or not he's playing, and ridicules the other players for their mistakes. My son tried out for a 12U select 'travel team' through our league, because they don't have an 11U team. 21 boys 'tried out' for the team. I have that in quotations because it was a joke. There are 5 coaches for this team, including my son's current coach. ALL of their boys automatically get a spot and they are mediocre players, at best. They admitted that they didn't even 'try' at the tryouts because they didn't have to. Then you have the boys who played last year, who also automatically get a spot, because their folks are friends with the coaches. So technically, there were 2 open spots, because 11 were already filled prior to the evals. My son properly fielded every ground ball, caught every fly ball hit to him, threw 5 out of 5 hard strikes right down the center, hit 5 out of 5 good pitches, and had the fastest sprint times, running from home to first, and running the bases. And he's a YEAR younger than ALL of these boys. The coach told me yesterday that he didn't make the team. I was livid. I kept it to myself, but I was pissed. The 'politics' in this league are so blatantly apparent. My son knows he's a better ballplayer than most of those kids, especially all of the coaches' kids. I know there is absolutely nothing I can do about it and it breaks my heart. My son had another kid fall on his ankle at school this week and is on crutches due to a bad sprain. He put his crutches aside and still participated in practice, yesterday. That's how much heart he has. The coach's kid was on the bench most of the time, because he was 'tired'. What I want to do is pull him from the league and let this team struggle without him for the rest of the season. This seems to be typical of Little Leagues. We have seen it for years at our's. The coaches that get put in the place as managers of all stars are always certain ones and their kids are on the team which is fine, IF their kid can play and deserves the spot from how he has played. Lots of times that is not the case. Sadly most the teams end up where its a travel ball team of that coach as well and they fill in the spots with whoever else. Then there are those that pick their friends kids. Alot of the time none should be put in those spots. It is just tiring to see kids that you watch all year and you know should be in an all star spot not get picked because of the pathetic politics of it all. We had an awesome pitcher on our son's team this year but he wasn't even picked. Then there was another kid from that team that was for a different age group and he wasn't that great. Our son is a good player but we know not what one would consider all star. Its just sad when the kids see what is going on and how ones are picked themselves. What is bad is when you see some of the same teams over and over again each year for all stars. Coaches that really shouldn't even be coaches to begin with and parents that will do anything to get their kid on those teams. Its terrible. There has to be a way for this to change but obviously it would have to be something all would be willing to have happen. Which of course we all know most those parents won't let it. Youth baseball is not about teaching all the kids much of anything. What it IS about is people trying to advance their own kids as far as they can, and screw the other kids who get stepped on. Oh, sure, there's the old, "Volunteer to coach if you don't like it," but the current coaches won't give up their coaching spots, because they won't be able to show gross favoritism toward their own kid or their friends kids. They would hate for their kids to have to play on their merits. You could volunteer to coach...but all the current coaches get the All Star Votes, and thus can NOT vote for your son should you decide to coach. Just went throgh some BS here in Ventura County, CA. My son was invited to play on a travel team. At the end of the regular season I was told it was a tryout situation. Then last week we got the email saying that if he was interested "we would love to have him on the team" so I thought the tryout were kaput. We showed up to the first practice with 6 hrs notice. And two more practices over the next 3 days. I passed the coaches info to another dad of a kid my son was teammates with during the regular season...and he attended the third practice. WHat I didn't know was that my sons coach for the regular season had a beef with the dad whose son I reccomended. This coach is also the general manager of the travel team. Two days after the third practice I get an email calling my 10 year old's level of focus and commitment into question and saying he wont get any playing time and he's not focused. Mind you there were only 7 kids at the first practice and 8 at the second. My son was at both of those....3 to 4 kids no showed, and they are being cut. Its just sad that personal BS can be brought into it. My son was angry. But now he's signed up for regular fall ball, and coincidentally, the travel team plays in the same fall league. I told him to work his but off and show them what he is made of on the field. he won the sportsmanship trophy this past season, never missed a game or practice, and frankly is a good hitter and no better or no worse than many of the other players out there. I meant that 3 or 4 kids no showed and they ARENT being cut. The preamble in the Official Rules of Little League Baseball suggest that little leagues would all be best served if the players selected the All Star teams. Our CT league has moved toward a kid selection process with good success. The kids know who are the All Stars amongst them and, when players are close in skill sets, the ones being voted in are the better teammates - an attribute that is not given enough credit sometimes. Do the kids know the opposing players well enough to pick the best 15 players? Sorry about my very late response but at least I can tell you how it worked. The answer is yes. Our leagues have 8 Majors Teams, for a total of about 96 kids and each team plays each other at least twice during the regular season and again see each other in the playoffs. They all know who the better players are from what the see on the fields themselves. We have a 5 field complex so they also watch each other's games when their own end early and all meet at the Snack Shack to catch up with each other on what teams won, lost, who played great, etc. I agree with Tom, the kids do know who the best players are. They are usually right on. In our Little League we have 2 All Star Teams, National and American. The kids in each League vote for 9 players. The top 9 with the most votes are in. The coach then gets to pick 4 more players. We are a decent size Little League. I served 3 years as VP and now as President for 2. I will tell you that no system is perfect and that we have had to tweak it several times but here is where we are now....all head coaches in a division vote to determine that All Star (called tournament ) Head coach...this was put in place as it elimated the coaches who with a 20 run lead wanting to" drive the other team into the ground and even further embarrass" the other team (you can win with class lest you can win every game and not chosen to represent the league at tournament ). Next,parents are the worst at determining their kids skill level. Non coaching parents are the worst of the worst. Stats lie as each team generally keeps their own stats and thus errors turn into hits and triples when in reality it was a single with a 2 base error. Each player must attend a 2 to 4 day tryout. The selection board rating the performance is the head coach and every coach from that division wanting to participate. With generally 8 to 10 coaches scoring the coaches that inflate a score fir their kid generally don't make a difference and the good kids are at the top. Where a kid who really played well all season and then stunk up the tryouts and" bubble kids"...the coaches sit down and talk thru it to decide. Finally we give every tournament player a new uniform with the leagues' name on it but have them wear their regular season hats. What this does is show the diversity of what teams they came from or sometimes shows that the team was made up if primarly 2 teams. If the 2 teams were the regular season best it simply makes sense. I also require each team to take the maximum allowed players to ensure more kids make the team. So far so good. Good to decent performance in the tournaments and mire importantly better for the league. Once again nothing is perfect and take pieces from each league and develop what works. That is the best idea that I have ever heard - ODP soccer is similar. The top kids from 3 different districts play in a 3 district round robin tournament with evaluators watching. The best 36 kids are selected roughly 8-14 per district. - these kids train together for one month - then the top 18 are selected to represent the state. The team is selected by non-parent, professional coaches. Good on you actually requiring they take the maximum players. Our league picks 11 kids year in and year out and 2 kids who have been on the team every year were playing up. I think that is absolute crap. My thing is that the whole All-Star thing shouldn't start until 9 at the earliest. At this point, the kids have control of the game. Meaning that kids pitch, not a coach. We are now playing 8U hybrid pitch. The majority of the All-Star tournaments are CP. Why teach kids how to pitch all year only to step back to CP in the summer? I thought I'd be ok with it this year, but I'm not sure. He was invited to try out for 'Premier', but we chose not to, we wanted a more gradual transition into KP. As a Little League Girls Softball coach I have been hit with board politics. I took my team to the championship games winning them all . Two years in a row! Still I was passed up to coach the All Star team. A board member got my spot. The the 3rd year another coach got snubbed just like me after she went undefeated all season. No All Star coaching spot for her either. Same board member/coach got the nod. This year I was not even selected to coach a team. I guess the competition is just too much for her and she had to get me out of the way so she could try to have a winning season. It's interesting. This year my son's team won the championship, and he was on a tear through the last 8 games, something like 24 at bats reaching base on either a true hit or a walk with about 2 k's . We were very surprised when we got an email saying he was invited to the all star tryouts, We have become accustomed to not expecting anything when it comes to All-stars because In reality all you have to do is look at the list of head and assistant coaches, and you can determine the lineup of the all star team...all sons or relations of the head and assistant coaches. My sons two coaches were great, but its odd when you see their sons batting 1st and 2nd in every game all year long, and never ever setting foot outside the infield dirt. Also one of the coaches sons would whine to play certain positions, and lo and behold next game there he'd be. jn any event, the two kids were not of the right age to play on our divisions all star team, they had jumped up one division and were a year too young to be considered under the rules. In my opinion if that's the case....you have forfeited your chance at all stars. Instead they are allowed to jump down a division, thus bumping two deserving players who played there all year.. Its silly. So in my sons division there are 24 invitees, and only 12 spots on the team...they try and make it a big show that its all performance and attitude based, but in reality you show up and there really are only 2 spots up for grabs because the sons of all 5 head and all 5 assistant coaches (after the coaches of my sons team went down a division) are assured a spot on the team...I'm typing this the day before the announcements are made, and will update after the team is announced...but I think the first 10 spots were set the moment the coaches and assistants signed up in January. Next year if we get the invite we will respectfully decline. Sounds so similar to my league. They say they will pick 13 but they have only picked 11 every stinking year. And two of the kids every year have played up! My kid played short all year and could plug into ANY position. He worked hard and slapped base hits against the very best pitchers all year. Rarely was he not on base. I just wish there was somewhere he could play in teh summer. This league is a joke. To follow up on my post above^^^ Results are in...Little League board, coaches sons and assistant coaches sons all made the roster. And not one kid from my son's team...the championship team. That is a shame. Sorry to hear that, and more pathetically just how predictable it was for you. I can sympathize with "its odd when you see their sons batting 1st and 2nd in every game all year long, and never ever setting foot outside the infield dirt." That is so true! Our coach had his two kids on the team, neither played outfield ever, and his oldest was perhaps the worst 3rd baseman I have seen. I don't think he's ever caught a single ball all season. My kid just finished up his last year of little league with no chance throughout the years to make the summer team. It is the all-buddies team. They pick only 11 kids every year. Does anyone find that ridiculous? The tryouts are a joke. The same core 10 have been on it since t-ball. The really frustrating thing is that two of the kids on the team are playing up! But they are good friends with the other kids. Why can't they just play at their own age level? My guy struck out 3 times this year (early in the year). His batting average and OBP was very high...but like others here, he was not a HR hitter (like most of the all star team). Just got base hits and the occasional double. Very good fielder, very fast and athletic, but smallish for his age. His coach had him at SS most of the year but he can play any position well- even played catcher well. He was also the team's 4th/5th pitcher and often closed tight games.He had a streak of 4 games straight where he had a perfect OBP. He was hitting the very best pitchers in the league with ease all year. He put in a lot of hard work this year and it just kills me that he never got to experience the high level summer play. He loves the game so much and plays it well. Venting here, but I wish there were summer options for him. It is frustrating that so many towns around us he would be playing on, but we are stuck in this league. Our league in Blackfoot Id. is pure politics. My sons coach called me this morning wanting some input from me on his all star picks. One name really surprised me as I spent over a hour yesterday trying to teach him to hit. This kid has one hit all season and not a good fielder either. I was informed my son lost his spot for all stars for this kid because as a coach he was directed that sponsors,coaches and commissioners kids are to be selected first. The sponsors son cannot hit or field. The commissioners daughter has changed her playing ethic to "I don't want to be here" . The coach's son should be there as well as one other nominee. My boy, who has had one error all season, plays short stop and pitcher and is one of the best hitters stays home while a kid who cannot play goes to all stars. Our league is pure political and they wonder why they lose all star games by 20 points. I was told my son cannot go because a kid who cannot play but is the sponsors son is going. The coach was directed to nominate only sponsors,commissioners and coaches kids to all stars. I volunteered every practice and coached third base all season. The kids that are all stars will not be playing this summer here. My kid has been picked for Allstars 3 years now and they always play him the minimum and he smiles the whole time on the bench and then cries himself to sleep after every game he tells me not to say anything to the coaches and it kills me. We had a little different experience. Our current all-star manager sat out the last couple years due to being angry and abusive to players, and humanity in general. But they like that aggressive, competitive type for all-stars so he's the guy. Our son led his age group in hitting the last 3 years, and is a good player on his travel team, which is better than our league's all-star team, and its not even close. So the two last-place teams filled up most of the spots on the all-star team, while some great ballers, including my son, were not selected. Once he found out who the manager was, he was actually relieved. Similar happened to me as a kid- I was a good player who got snubbed for all-stars. A few years later, when I went to high school tryouts (and made the team), I looked around and only saw a couple of those kids still playing. It's heartbreaking for kids, who don't understand the entitlement and shameful behavior of the adults who are supposed to be their role models. I try to put it in perspective for my son. He likes rec ball because he has lots of friends there on the other teams, but we are thankful for his travel team, who likes him and invests in him, and he knows he will get a fair shake. just let the kids vote and they will pick the best every time. let the coach be selected by the other managers (by vote) - give the coach some discretion on a couple of picks even if his kid is #20 in the league - he is volunteering countless hours, and yes stop your crying. In our league, which has four majors teams, each coach picks his own 5 best players. This creates a list 20 all-star nominations. Then with that list the coaches are asked to pick the 10 best players. The 10 players wth the most votes are picked to the all-star team. If there is a tie for the 10th player a separate vote is held on just those tying players. After the 10 are chosen the manager of the all-star team wil get to pick two players at his discretion. These picks must come from the list of nominees. This hella in case a needed position player was not picked, for example, none of the 10 kids picked play catcher. The coach has the ability to then pick the best available catcher fr the lit of nominees. The best way to avoid the politics is to have a well communicated and transparent process for selecting the teams and make sure everyone knows ahead of time what that procedure is. We even list on our website "congratulations to this years majors all-stars nominees". This can help soften the blow of not getting selected by knowing you were at least nominated. Of course we all know that it is almost impossible to make everyone happy but the more people involved with the selection helps to keep politics out of it. IN our league the same kids make the same all star team each year. They are even told on the side dont worry if you were an all star last year you will be this year. One of the 5 majors team we have in our league sends 6 players to the all star team of 12. As well as their coach. And to top it off this year we had kids playing on two all star level teams while others were cut. In our league in Suffield, CT; the President and Vice President select the teams over beers with their friends. I am Secretary of our Board and we have 2 Major Boys teams, the coach with the most wins of the season is offered the HC position & the other coach then is Asst Coach & usually the HC picks his regular asst coach as an alternate asst coach - the 2 regular season head coaches get together & pick their best players for their All-Star team and the Board approves/disapproves by voting. That is written in our own bylaws - if parents complain they are to call our President or VP to handle. In the end you just can't please everyone. I am so disgusted with Little League this year after finding out that the coaches gathered and voted for the 12U all-star team when most of the teams in the league had only played half of their games (due to rain outs). My son was not chosen, though he was batting 800 while catching each game. My protest was not that my son deserved a spot. It was that each of the boys in the league should have a chance to earn a spot by virtue of their play. I was told by the league President that because some of the teams had never played each other, certain players were not considered because the coaches "just didn't know them". The coaches simply chose their sons and those they were familiar with. No stats were considered. I feel that some players were cheated out of their last chance at a precious memory. All star time again, and my son made the Juniors team, which he was happy about, but we should have taken a clue from how last year went, certain kids play the whole game and certain kids get benched alot. My son never missed one all star practice, and more often than not, there were at least 3 or 4 kids absent each practice. First game was last night and my son sat for 5 innnings, he's pissed and doesn't even want to go to the next game because he feels they are wasting his time. We told him wahtever he wants to do we will support it, but he did commit to the team...but then again, they let him down. Furthermore, one of the coaches sons plays 2nd base game in and game out as he has all year, and he's afraid of the ball, at least 15 errors this year balls going through his legs, he can't keep his eyes open or square up on a grounder....it's frustrating when I know my son would sacrifice a ball to the face to make the play. As someone who is coaching an "all-star" team this year and whose son made the team the last two years, there's a couple of things I take away from all of these comments, first off where are all these kids that hit .800 and don't make any errors? I haven't seen them in my time as a youth coach. Second, I read a lot of people complaining about leagues not taking the maximum amount of players, in Little league taking 13 makes it so every kid doesn't have to play the field, mandatory play rule is strictly one time at bat. So careful what you wish for sometimes as teams that take 13 usually do it for the ease of getting everyone in the game without sacrificing any defense. I'm shocked by the number of people saying that kids, sponsors, league officials etc.. kids get first choice, I can't say I'd find it any fun to coach an all star team that can't compete with the other teams. A team of the best 12/13 players is the way to go, keep in mind for most of us coaches, "best" is a combination of skills + attitude. I've seen kids who produce better than anyone get cut because they didn't try at tryouts, or just assumed they're on the team. I recently turned 50 and the night the all star team was posted, I was on the field playing. Oh, a player on the other team told me that we had both made the all stars and we joked together about what a great time it was going to be, a winners laugh. After the game, my mother told me that I was not on the list. I said she was wrong and I rushed passed her to read it myself, posted on the concession stand wall. I could live to be a thousand years old and not seeing me name there will still be the worst night of my life. I wept openly and uncontrollably. It was hard to breathe, gasping for breath, my hands clenched covering my face, sitting on a log on the edge of the parking lot. I walked two miles home. I don't sit around thinking about it, but every once in a while, it does come to mind, and it still hurts, like part of my soul being torn out and shown to me on the end of a pike. My father was the president of the local little league. Politics involved? One good, but very marginal player had a story so incredibly unique, now-a-days the term "politically correct" would be used that this person must be chosen for the team. A few days later there was a big story and big photo of that player with the mayor in the local paper. It still hurts. I stayed with it over the next six years and hit some home runs in high school when while most of those all stars dropped off and dropped out of the game. It still hurts. Why pretend to be fair in all-star selections when no one will either question the politics or pretend to even try to be fair. Let's recognize it as nepotism, then see it and call it as such. Why all the fuss? Save yourself the energy. You're all in this for your own kids so who's gonna blame you? I see so many "all-stars" who can't even catch a damn pop fly or field a grounder on my son's travel team. Sooner or later these all stars are going to get found out. Until then, let them (and the daddys) enjoy a little delusion of granduer for as long as they can. Why not? Great ... I like your blog and your food ... I am very pleased to find a lot of useful information here. We are trying to use technology.